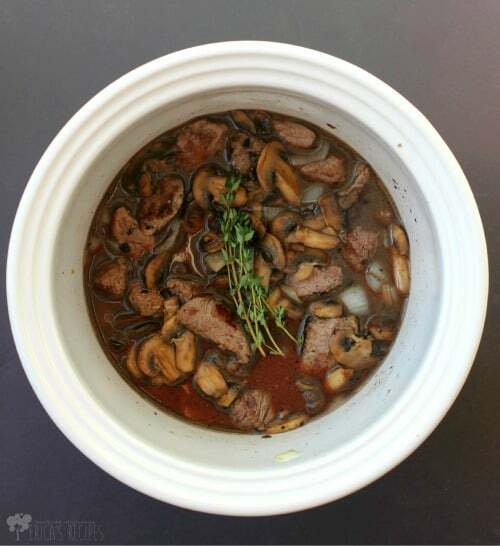 Beef tips with mushrooms and thyme. Slow cooked in broth and red wine. Simple. Classic. 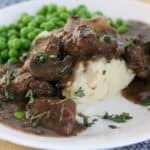 Crockpot Beef Tips with Wine and Thyme. Ahhhh, the first sign of fall, YES!! I have been out running the past three mornings, and there has been a cool breeze each time. So runs are sucking less – a clear sign fall is on the way. The air is starting to be breathable again. The morning sky is crisp. Less haze. Yep, doesn’t matter that the temperature is still getting up to the high 80s, fall is definitely coming – I can feel it. …So it was time to break out my slow cooker. I am not much of a soup or stew kinda girl. Just check out my paltry Soups recipe index and you’ll see. …Embarrassing, I get it. But I do think I should change that. 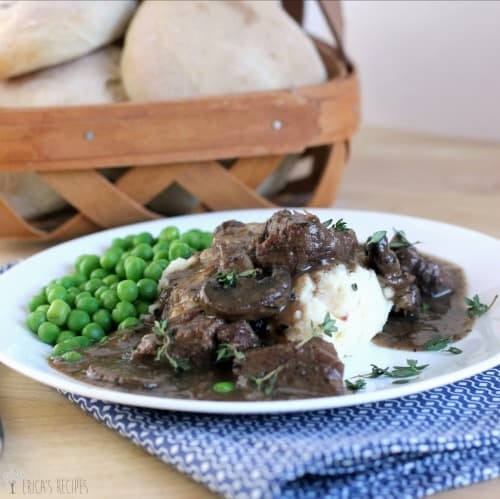 Because when I do make a heavenly Crockpot Beef Tips with Wine and Thyme dish like this comforting, gravy-licious beef, I am always so happy I did. And my oh my oh my, is this just the best thing ever. Crockpots were designed for recipes like this. Crusty bread was designed for recipes like this. Mashed potatoes too. Searing the meat first ensures this stew will develop that depth of flavor that really characterizes a recipe like this, then cooking low and slow ensures all the connective fibers in the meat break down. The result is too tender and tasty to describe! 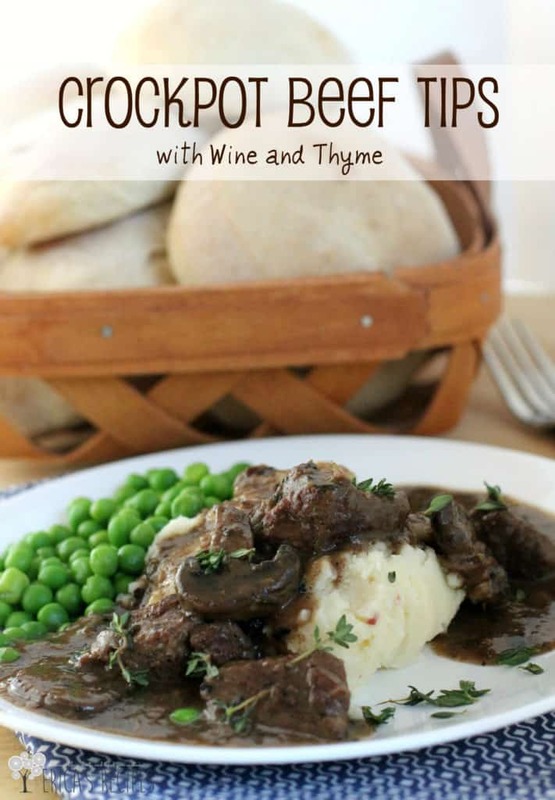 …Just make sure you have lots of crusty bread to go with this Crockpot Beef Tips with Wine and Thyme. 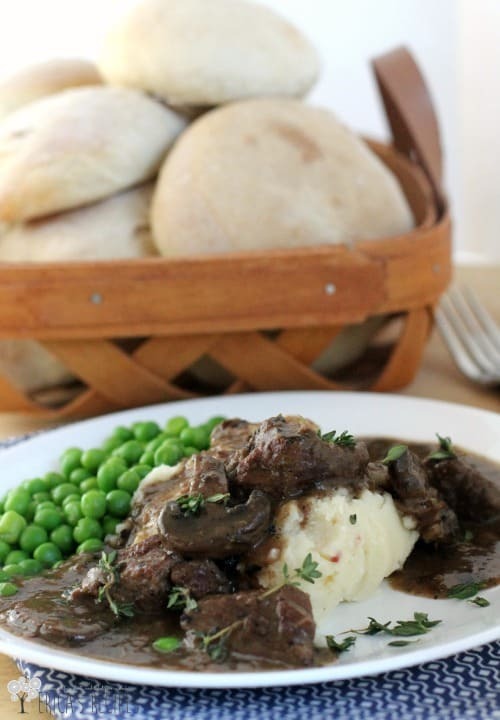 Beef tips with mushrooms and thyme. Slow cooked in broth and red wine. In a large saute pan, heat 1 tablespoon olive oil on high heat. 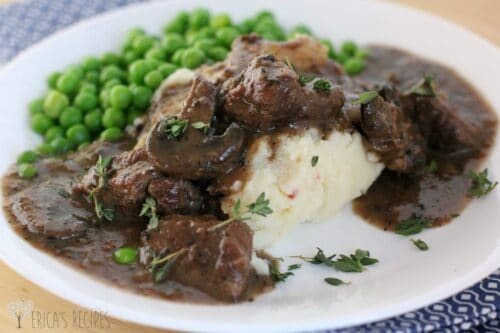 Toss half the stew meat in 1 tablespoon flour and add to the pan. Brown the meat well, turning to get all sides. Transfer the meat to a crockpot. Repeat with the remaining beef, 1 tablespoon flour, and 1 tablespoon olive oil. To the saute pan, carefully add the red wine (it will steam and boil!) Use a wooden spoon or spatula to scrape up all the browned yum-yums from the meat. Cook a minute or so until the wine is reduced to 1/2 to 2/3 c cups. Transfer this mixture to the crockpot. Heat a new saute pan on high heat with 2 teaspoons olive oil. Add the onion cook until lightly browned. Transfer to the crockpot. Heat the remaining 1 tablespoon olive oil in the pan used for the onions. Add the mushrooms and cook, stirring occasionally, until mushrooms are browned. Transfer to the crockpot. To the crockpot, add the beef broth, pepper, and thyme sprig. Cook on low 6-7 hours or until meat is very tender. In a small bowl, use a fork to mash together the remaining 2 tablespoons flour and the butter to make a beurre marnier. Stir into the crockpot (this will thicken and flavor the gravy). Let cook another 30-60 minutes and serve. Season to taste (mine needed 1/2 t kosher salt) and add the remaining 2 teaspoons fresh thyme leaves. Serve over mashed potatoes or buttered egg noodles. 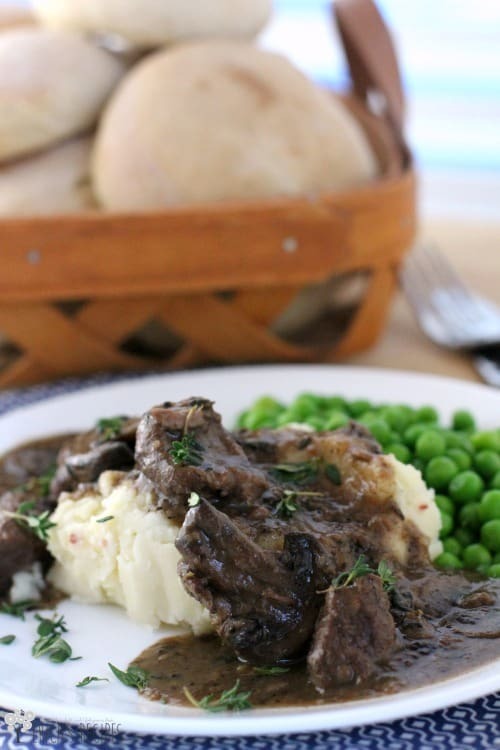 This dish is definitely comfort food, and all the flavors I adore! The minute I saw wine, I was hooked! Then I saw red wine (my favorite) and I thought, I must make this one. Beautiful dish looks and sounds delicious. Thank you for sharing! these look so delicious, and so perfect for fall. I foresee these on my meal plan for this week! The perfect meal for the coming cold days! Thanks for coming and linking up at The Weekend Social. All posts get pinned on our pinterest board! 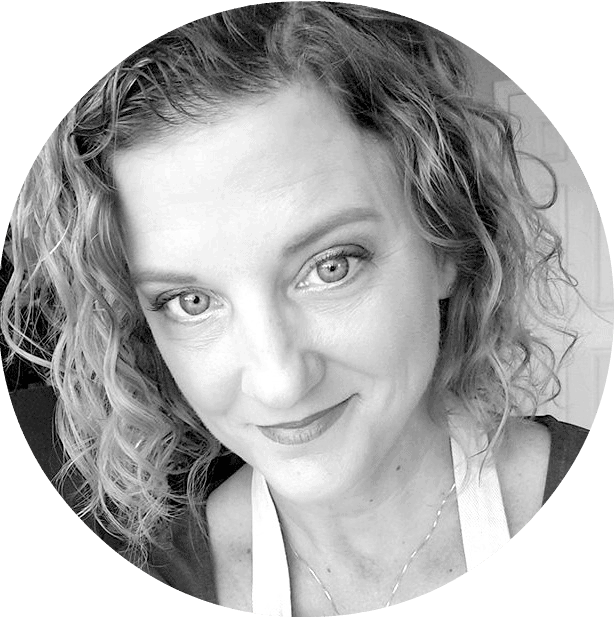 Please be sure to come back next week starting Thursdays at 9PM EST on culinaryflavors.gr! I hope to see you there! I’m always looking for a good crock pot recipe! Thanks for linking up to Creative K Kids Tasty Tuesday party. 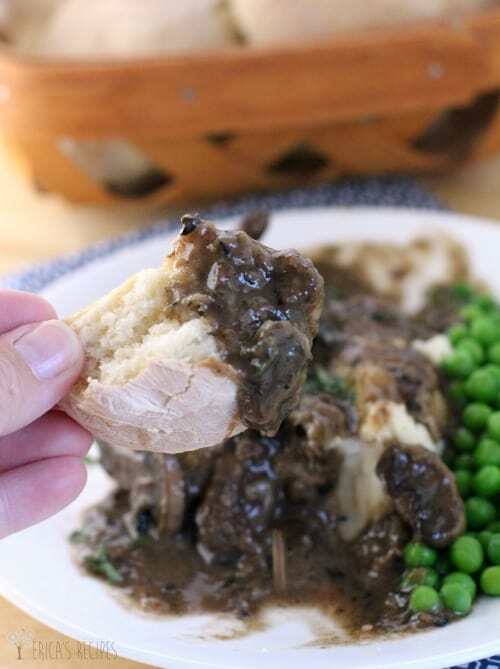 I’ve pinned your recipe to our Pinterest board. Always looking for warming crockpot recipes this time of year. Awesome seasoning. PInned. Thanks for bringing this by Weekend Bites. Erica as always your recipes look divine 🙂 And I am featuring it as part of my #FoodieFridays faves this week!!! Come on over and check it out!!! Thanks so much for linking with us!!! We are looking forward to seeing more from of these types of creations soon! I am making this for church potluck on Wednesday. Cannot wait! FALL!!!! !